Sporty adrenaline isn’t a standard feature among most compact sedans, but luckily for all of us, the 2019 Acura ILX has never been a model that’s willing to conform to convention. It’s formed quite a reputation for its bold styling, high amounts of innovation, and underrated performance capabilities both inside and out. This has made it an industry frontrunner in many regards, a tasteful and worthy representative of a new age of compact sedan engineering. The ILX is set to return to Salem OR for 2019 with all that you need to keep your drive memorable. 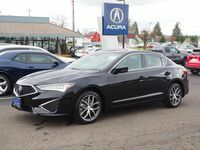 Our Acura of Salem team is committed to serving the residents of Salem OR with transparency and knowledge about all the models that we offer. Join us today if you’re interested in learning more about what the 2019 Acura ILX brings to the table! We’re willing to bet that you’re interested in seeing the 2019 Acura ILX in its true element – the open road. If so, you’re more than welcome to schedule a test drive of the model with Acura of Salem today!